Canine distemper virus (CDV) causes a serious illness that can threaten the lives of our beloved dogs, so many pet owners take care to vaccinate their furry buddies against it. But CDV can also infect a diversity of wild carnivore species, from coyotes to skunks and raccoons. Unfortunately, CDV has now found a new target—the Amur leopard (Panthera pardus orientalis), the most endangered big cat in the world. At one time, the Amur leopard—a uniquely cold-adapted subspecies of leopard—ranged over large portions of northeastern China, Russia’s Far East, and throughout the Korean Peninsula. Today, only about 80 individuals remain in the wild, in a small territory along the Russian-Chinese border. For decades, the Amur leopard has been the victim of a combination of poaching, over-exploitation of its prey by humans, and habitat loss from human encroachment. This extreme vulnerability is what makes the newfound CDV infection of a two year-old, female Amur leopard—described in a paper published this week in the Journal of Wildlife Diseases—so concerning. Especially considering how dangerous canine distemper can be. Animals afflicted often suffer high fevers, coughing, runny nose and eyes, and if the infection is bad enough, neurological deterioration, seizures, and death. Tragically, it’s in this latter, advanced condition that the infected leopard was discovered by a team of researchers from Russia and the U.S. 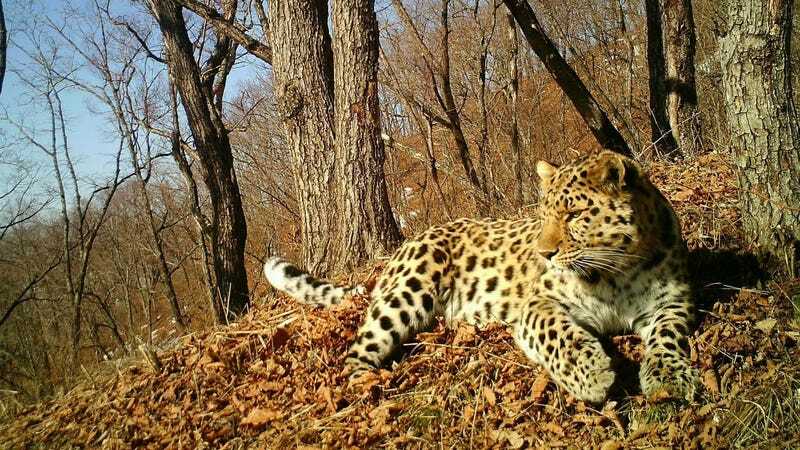 In May 2015, the leopard was found near a road that crosses through Land of the Leopard National Park in the Russian territory of Primorskii Krai. It was gravely sick, indifferent to its surroundings, and without any fear of passing vehicles or approaching humans. The leopard was brought into a local animal rehabilitation center, where veterinarians cared for the weak animal. Despite their best efforts, the leopard’s neurological symptoms worsened. Eventually, veterinarians euthanized the leopard as a humane measure. A postmortem examination of the leopard’s brain tissue, combined with a genetic analysis detecting CDV-specific genes in the tissue, confirmed the disquieting reality. To help determine where the virus may have come from, the researchers compared genetic markers in the leopard’s virus to those in other strains. They found that the leopard’s strain was most genetically similar to viruses that have infected Siberian tigers and Lake Baikal seals. However, the study authors think it’s more likely that the virus was transmitted from more abundant local carnivores, like domesticated dogs or wild sables or badgers. Fortunately for the Amur leopard, it may be difficult for CDV to spread between cats. The subspecies is so rare that CDV may be slow to hop from one animal to another. Amur leopards are also fairly antisocial, lowering the chances of leopard-to-leopard transmission. In contrast, more gregarious species have experienced catastrophic impacts from CDV outbreaks; over 1,000 lions died in Tanzania’s Serengeti National Park in a CDV epidemic in the 90s. The main concern is that the disease has spilled over from large virus reservoirs in other animals, and that this could keep happening. The population of Amur leopards is so small that even infection of one cat at a time could have drastic impacts, a sobering consequence of radically small and fragmented populations in a sea of routinely infected species. Until more is known about how and where the virus has entered the leopard population, the study authors contend that the best defense against CDV is continued traditional conservation practices. Distemper only presents a threat to the Amur leopard because the population is so vulnerable. By establishing larger, more interconnected populations of leopards, the critically-endangered subspecies may more easily buffer against losses from the disease.